- This version is nearly the same as the one I was about to release anyway. Read below for details. READ THE INSTRUCTIONS BEFORE DOWNLOADING AND USING. This Mod is still unfinished, but is 100% usable... there are areas which may SEEM buggy (missing walls, floating doors, etc), but they aren't. ONLY POST COMMENTS IF: you have something politely constructive to say, have a technical problem, or want to express your truthful opinion on the Tower (don't forget I READ this stuff, and may respond accordingly!). - Player-Owned Storage; so items placed in containers will stay there permanently. - If upgrading from an OLD version: DISABLE the PREVIOUS version of Overlook Tower MAINvX.esp! - DO NOT disable or rename the Overlook Tower - BASEv1.esm!!! * This ensures you have a relatively CLEAN saveGame to bridge versions. If you do NOT do this, and saved your game in the same area a mod alters, STRANGE THINGS may happen - potentially DAMAGING your future saveGames' data. - run the game; and in the Skyrim Launcher, click "Data Files"
- click "OK" then click "Play"
Strategic Operations Center (War Room) - Activate the little banner posts on the 3D Map to travel instantly across all of Skyrim! 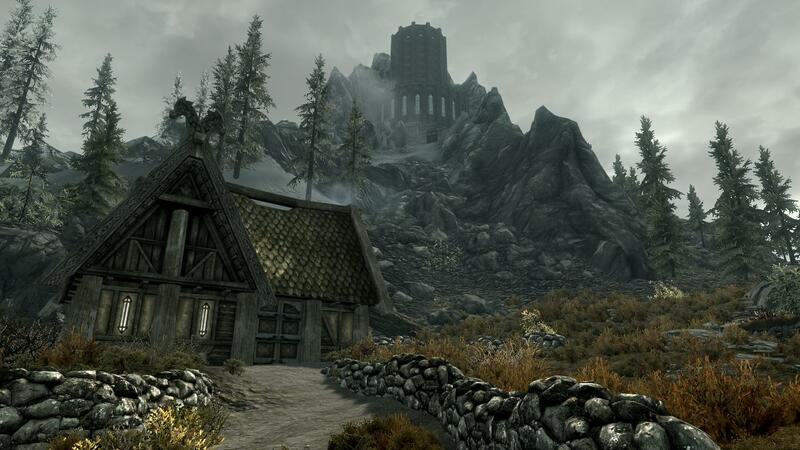 All the Player-Owned Homes are included, as well as the Winterhold College and Jorrvaskr. Some of the smaller towns, spouse-homes, and other significant locations are included as well. To RETURN to the Tower: each location is return-linked through the little Ysgramor Garden Gnomes, found in easy to spot yet inconspicuous places. There is a 'Housecarl-Cat' which is set to PlayerFaction. It will NOT attack you, no matter what kind of front it puts up. This is the only violent creature in the Tower that will never attack! There is also a Giant out front - he WILL attack you, but only if you are within a couple steps. EVERYTHING in the Tower RESPAWNS except for Player-Storage. This means all the creatures, critters, fish, animals, flora, ore, salt, fungi, etc - so kill em & harvest their ingredients whenever you remember to! "Can't find it" "Not working" "How do I..."
- place "skyrim3dmap.nif" in the folder "DATA/Meshes/SLuckyD/OverlookTower/"
- place "skyrimLOD16.dds" and "skyrimLOD16_n.dds" in the folder "DATA/Textures/SLuckyD/"
- place "drsc_wardrobe_close_02.wav" in the folder "DATA/Sound/FX/DRSC/Wardrobe/Close/"
- place "drsc_wardrobe_open_03.wav" in the folder "DATA/Sound/FX/DRSC/Wardrobe/Open/"
- place "Overlook Tower - BASEv1.esm" in the folder "DATA/"
Do NOT panic if you see strange things, such as floating doors or missing walls: These are NOT a glitch or bug! These are places I haven't placed or arranged any objects in yet. If you fall, you won't die, you'll just be transported back to the 'start' of that particular interior, unharmed. This stuff WILL be added and finished eventually. Torture Area - is attached to the SOC (the 'war room'), on the other side of the room are barracks for any troops you may want to garrison against (or for) impending invasion. Neither area is complete yet; though should be for the next release. A dedicated Training area will also be added at the back of the SOC room; the details of which shall be forthcoming as it gets closer to completion. Nether Regions - (formerly known as the Shroom Cave) This area is nearly empty because I have yet to place all the objects. I have included most of the animals, fish, and fungi down there. A quick walkthrough harvests everything - or eventually have one of the servants go and do it FOR you... but be careful - you may get lost, and not everything is as friendly as the chickens. I want to better nerf the slope next to the waterfall, as it takes a bit of shimmying to get up. Trophy Room - Currently empty, but eventually the walls will be covered with mounted heads and trophies (most of which will be scripted to Player's stats, such as number of kills, and for different animals)... as well as mannequins/displays strategically placed. In the center will be a ball-pit for oversized gemstones, as well as piles of boullion after having acquired certain levels of wealth (all specially scripted to Player's stats). Mead Hall/Kitchen - The 'dining area' will be placed on the balcony which skirts the walls of the hall at the top of the second floor. Bedroom, and other areas which seem EMPTY - There will also be MUCH more "clutter" and decorations. Furniture, idle markers (so your followers do more than just stand around), food, etc.. it'll all be in the next version or the one after! Rooftop garden - I plan to add more up there, but there are quite a bit of things to harvest up there already. The Summit's guardian is a dragon which can be seen for miles around. Don't worry though, it won't attack unless YOU attack IT first. SPOUSES - I looked into this, and I think I can do it; but the changes I would have to make might interfere with other mods which mess with spouses. Soooo.. I decided to leave this alone, and let the people already working hard on the anywhere-spouses and such mods get their stuff working properly, then use it in conjunction with the Tower. MANNEQUINS - I will eventually release an ADDON for these. Releasing it too early may cause future problems with lost items or having to 'move' stuff from mannequin version to the next. I have 'completed' my SPODUM Mannequin mod (linked below), so I will be working on this soon. WEAPON RACKS & PLAQUES, DISPLAYS - These will also be in a separate ADDON release... for the same reason as mannequins. This will be its own addon, to isolate future changes and their drama from altering storage other than mannequins'. - There will be humanoid NPCs eventually. Starting with the main person of the Tower... kinda like the caretaker or such thing. I've already voiced-over a basic rapport to explain the Tower's amenities, I just need to convert the files, generate the lip-synchs, and hook it up in the dialog editor. Hopefully soon! - There will be basic servants throughout the place - which Player may order 'away' should their presence offend (assign them to always stay in their rooms or wherever). These people may also be given tasks like harvesting the garden, cooking, potions, merchants or trainers, etc..
- If you think it's #3, try opening the console at the Title Screen (without loading a saveGame), type "coc aaSLuckOTMain", then try going to the location which makes it CTD. If it works, you SURELY know your saveGame is to blame. - Remember that saveGames should be made in areas NOT changed or added to by this mod,and ideally ANY mod... some obscure interior or the West Watchtower usually works good. Sometimes simply saving the mod in a different location works (while the older version of this mod enabled and the newer is disabled). - If you tried that and it still doesn't work... sometimes, though relatively rare, there is another mod which is interfering with the game in ways it shouldn't be. Try disabling other mods to narrow down any problems. - Some walls or other objects appear to be missing or floating, but they AREN'T... they haven't been PLACED yet. This will be finished in future versions... see below for details. - Distant LOD is VERY glitchy, this is a known bug in the CK ("Update Distant LOD Data" doesn't work). - If an NPC is talking to Player while a Garden Gnome is activated, that NPC MIGHT come through to the SOC (into the Tower) with Player, speak another line, then go back from whence they came. This doesn't seem to be a problem, but it may freak some people out. - Followers will not go down into the Grand Cavern area of the Nether Regions (the area which has the waterfall and animals). This latest navMesh bug thing with v1.5 struck just as I was working on this area, so I didn't tweak it out of fear I might have to do it all over again. If your follower gets stuck somewhere, they will always appear right next to you when you make an int/ext cell change (ie: go through a door from inside to outside). - I was unable to get Ivarstead connected to the Tower's 3DMap. Everytime I tried, the CK corrupted the entire town's navMeshes (making the whole area, ummm... unusable). So I decided to omit this town (there was an unlinked banner-post over it in the earlier version). - Lighting inside the Tower is all custom, but it seems not to trigger when it should. Also, when it finally does trigger, it remains on even after fast-travel to another location. This is because I use a custom weather scheme, and I haven't gotten to applying a solution to correctly transition it from place to place. I think I know of how to fix it... hopefully for the next version. - Any other mod which alters the areas I have placed my Garden Gnomes. - NMM or other modman software may not install the mod correctly, if you have problems: use the above directions for a manual installation. It's usually because my Data/ folder wasn't extracted. - added to the Shroom Cave, changed it's name to the "Nether Regions"
- if you were using the v1.0 I released around Christmas, you must go to the Tower; remove everything from storage, exit the Tower and fast-travel somewhere. Save to a NEW saveGame; restart and load that saveGame with the new version's files enabled and ALL the old ones disabled. Play as you like, as now you have no worries of ever losing your stored items again. Bethesda (or "Licensor" as defined in the Skyrim EULA) is not the author of the "Customized Game Materials" included in this package. SLuckyD is not responsible for any damage these materials may cause, and/or failure to successfully deliver any stated products or services. For those who may care: I'll be updating this mod (FINALLY) once the newCK is released tomorrow. I never expected it to take this long, and all the additions and changes I want (and need) to make are contingent on that new software. I apologize to anyone who was expecting displays, mannequins, and what-have-you... but like I said, I expected the CK to be released last month or earlier (so I never changed the description). I assure you that this player home will be quite worth the download once I implement everything (and more!). To those who may be experiencing crashing: This is almost always caused by my 'meshes' folder not being copied over to your game's 'data' folder. If this has been done properly, the only other causes I know of have been some sort of conflict with 'injector' mods or possibly 'script extenders.' This should be remedied once I remake the mod using the software intended for Skyrim... as opposed to something made several years ago for some other game. Thanks for your interest and enthusiasm, and I apologize for any shortcomings or disappointments anyone has experienced. Check back in a tentative week or two for the v2.0... which will better reflect what SHOULD have been the mod's initial release. Without a CK no one seems to be able to figure that one out. Awesome I love it. The only thing I'd change is I LOVE manekins and weapon/sheild racks for display. I think 10 manekins would be awesome and as amny racks as you can fill in space with :)! Sorry, but the initial release had the orig ESP file in it... NOT the ESM file as stated. I up'd the ESM version (which is the same, just allows for addons/updates without Players losing their storage contents). I suggest using the ESM, though if you already got the ESP: I suggest emptying all storage before replacing the ESP with the ESM (you may potentially lose all that stuff, though you may get lucky).